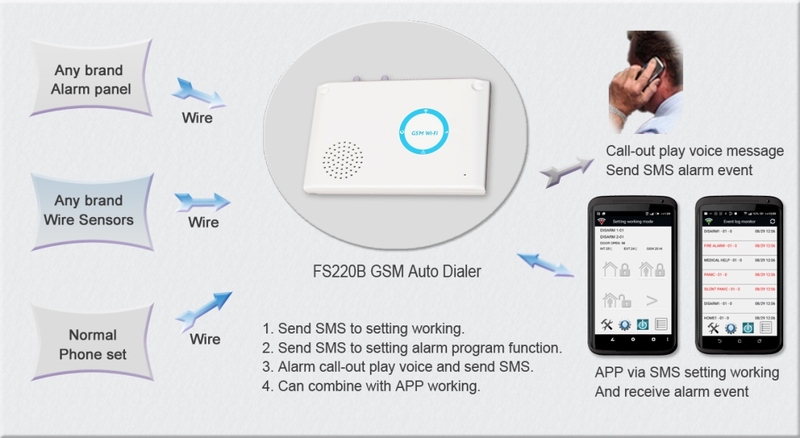 The FS220B 3G GSM auto dialer with SIM5320 module dialer digital/voice/SMS report offers Four-Band 850/900/1800/1900 GSM system. It is approved by R&TTE and GCF. The GSM dialer can connect normal phone set and other brand security console, and the normal working is on wire PSTN phone line system. When the PSTN phone line disconnects with the system, it will automatically transfer to GSM dialer system. It is kind of low price GSM dialer and it has full call in SMS operation and setting function. Can combine with normal phone set, alarm console or IP voice route transfer to GSM call-out. When the PSTN phone line disconnects, it will automatically transfer to GSM and send event SMS. 5 LED indicators for Power On/Off, GSM/TEL, GSM on-line, TEL on-line and system fault. Can connect to PC via USB port on window software to read/write setting all programs. 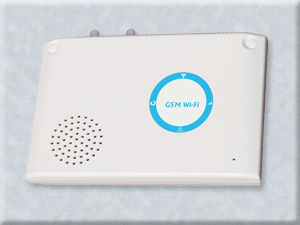 Built-in input NC/NO port can connect to wire type sensors, alarm console or panic buttons to call-out to report alarm event. Built-in 2 wires alarms output ports can trigger external siren, and NC/NO relay switch can control the light/CCTV. Built-in rechargeable back-up battery, Tamper Switch and Power Failure Detector can automatically call-out report alarm event. Call-in to send SMS command to console to request replying working mode.